Firstly, I am not about to downplay the loss and tragedy that has unfolded this week in Sydney. My thoughts and feelings are firmly with the families of the deceased hostages and the surviving hostages. Nor is this a discussion into the politics of extremist groups or what led them to become extreme. It’s simply an observation regarding the powerful effects words that our media and elected leaders choose to use and how they influence ordinary citizens. 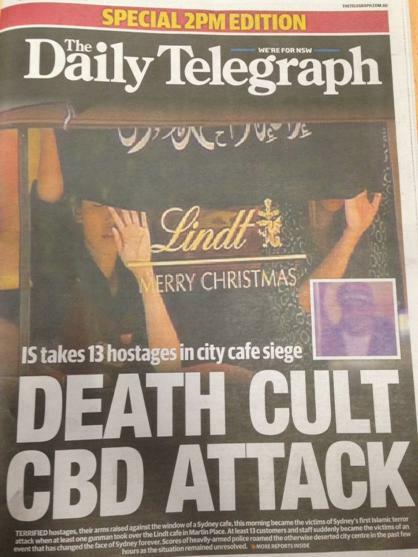 An armed man this week entered a café in central Sydney taking the staff and patrons hostage for a 17 hour period. 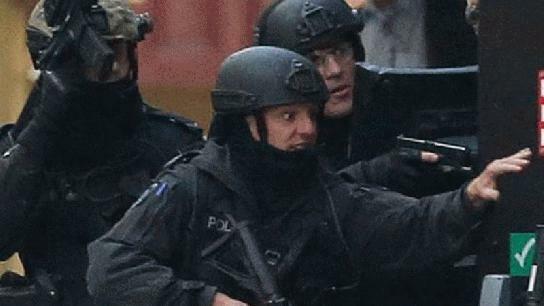 During the climax of the siege, 2 hostages lost their lives as did the gunman. It is not clear whether the gunman was responsible for the deaths of the innocent or the police force was but regardless – I don’t see it as relevant. It needs to be said that a flag with similarities to ‘The Black Standard’ (that dates back to the early days of Islam), was paraded on the windows of the café during the siege. Its translation reads ‘There is no God but Allah and Mohammed is the messenger of God’. This flag is not associated with ISIS or any other ‘Terrorist’ organisation and is a common statement of faith for the Muslim community. All of these incidents were reported that an assailant had a grievance, was armed and a lengthy stand-off ensued as the Police Department attempted to keep the public safe. All of the accused in these articles we referred to as ‘Man’ or ‘Man with history of violence’ or ‘Man with history of mental illness’. All fair appraisals of the assailants and I believe to be reported accurately. Understanding that the press needs to sensationalize headlines in order to sell their papers, I would have though this headline would have sold just as many papers as what they decided to run with. So what is the difference between a white armed man taking hostages and threatening innocent people with weapons and an Arab man doing the same? Obviously the death of innocent people is an obvious difference between the 4 sieges in Brisbane and the siege in Sydney, but these headlines had hit the shelves long before any people had lost their lives. One has to assert that some form of agenda was at work with the reporting during this siege. Early this morning Prime Minster Tony Abbott addressed the Australian public with regards to the incident in Sydney. Although our Prime Minister did touch on the mental instability of the gunman, he made sure to mention (incorrectly) the use of the ISIS death cult flag during his speech. He repeatedly suggested the actions of the assailant as politically motivated and suggested ties with ‘extremist organisations’. Were the Caucasian ‘men’ in the Brisbane sieges politically motivated or just unstable? It would seem that while legislation is due to be debated in parliament early next year, the term ‘politically motivated’ justifies our Government in its attempts to impinge on privacy and civil liberties with regards to internet use, recording and storing of Meta data and a opportune validation of our attendance in wars in the middle east and our ‘turn back the boats’ policy – all under the ‘anti-Terrorism’ laws. (While public opinion is souring on these ideas). Unfortunately ASIO doesn’t have any jurisdiction over alarming incidents unless they fit into the new guidelines as their new powers mainly pertain to ‘Acts of terrorism’. As the Oxford Dictionary defines “Terrorism – The unofficial or unauthorized use of violence and intimidation in the pursuit of political aims” and “Terrorist – A person who uses terrorism in the pursuit of political aims”. So without being able to ‘pigeon-hole’ this latest unstable individual into the “Terrorist” basket due to his Political motivation, what justification would they have in order to pass their proposed legislation? With the constant bombardment from the media and then the cleverly chosen words of our Government, it’s almost understandable why a large portion of the public reacted the way they did. It started with messages of hate towards the ‘terrorist Muslims’ and as after the beheading by ISIS against western citizens earlier this year – the public’s response took a turn for the worst. As soon as word of this ‘terrorist attack’ had reached the general public, violent attacks were reported across all major cities against Australian Muslims. Australian Muslim leaders publically condemned the actions of the attacker. Mosques in Brisbane held multi denominational services through the day and night where hundreds of people met to pray for the safety of the people involved in the siege and the safety of the greater Australian Muslim Community. Yesterday, during the siege, as Australian Muslims were starting to be publically victimised by a misled and deceived community, a little ray of hope shone to recue our faith in humanity. A young woman noticing an apparent Muslim lady removing her Hijab after hearing of the situation in Sydney on a public train approached the lady. She admitted not really knowing what to say to the woman or even if she was a Muslim, but ran after her anyway and said “put it back on – I’ll walk with you”. This was posted on twitter and other people replied with suggestions to accompany Australian Muslims on public transport as they travelled home from work. 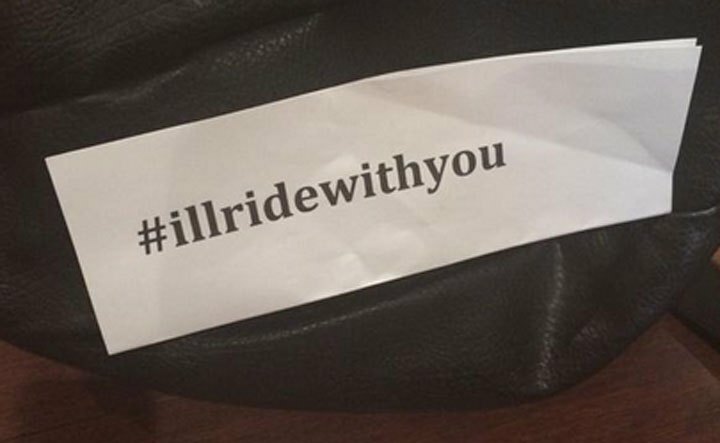 The wave of support blanketed social media under the hash tag #Illridewithyou. Stories of Muslim people with tears in their eyes, hugging Australian commuters who offered to ride with them started flooding social media and other media outlets. The movement – regardless of how simple it seemed, circulated around the country. It seemed that such a small gesture could unify a community to stand up to racism and bigotry. Even in the face of the negativity of our major media services and Government spokespeople, humanity found a way to buck the trend. By no means is this a solution to the ethnic troubles within our country or an answer to dealing with extremist disadvantaged and disenfranchised minorities….. But in the face of tragedy – it sure instilled a little belief back into my faith in humanity. Great post. For three reasons. 1. It emphasised that this was the action of a mentally unstable individual. 2. While it was an ugly event, Abbot may use this to create an even uglier climate with laws that will shift that oh-so delicate balance between freedom and security. 3. The hashtag #illridewithyou does generate that warm feeling in my belly and just in time for christmas.